Italian Fiat and US Chrysler automotive brands have in the past had partners, divorced partners, fraternised with other partners but in 2014 they found each other and it appears a successful marriage is underway as Fiat Chrysler Automobiles now known as FCA, says David Miles. Global figures just released show FCA made a global profit of 6.1 billion Euros in 2016, up by 26% on 2015. However their 4.7 million cars and trucks sold globally was 3% down on the previous year. In the UK in 2016 the FCA brands of Abarth sold 3,966 cars a 44.6% increase over 2015, Alfa Romeo 4,881 sales were down 3.7%, Fiat cars 60,581 – down 5.7%, Fiat LCVs 10,185 – down 13% and Jeep with a record 14,090 sales – up by 30.5%. Also a Fiat brand Maserati sales were 1,435 units the same as 2015 and Ferrari sales are undisclosed. Chrysler models are no longer sold in the UK neither are the associated brands of Dodge and RAM. Explaining in more detail why the iconic Alfa Romeo brand was down on sales numbers Ms Saxton said we were missing the new Giulia D-segment saloon which we will now launch this month but the C-segment new Giulietta hatchback has done well with around 2,500 sales. Alfa will get another boost later this year with the arrival of the Stelvio SUV. Commenting on the lower sales for both Fiat cars and LCVs Ms Saxton said that FCA in the UK has taken the decision to cut out unprofitable business such as the daily rental sector. Registration of too many discounted vehicles affects residual values which in turn causes problems for PCP financing and leasing where at the end of the finance/lease term the value of the vehicle proves to be less than anticipated. However currently our fleet registrations are 52.3% of our total sales whilst the industry average is 55.6% for fleet sales. In future we will be doing more profitable corporate business through our UK dealerships rather than large national deals. Currently we have 166 Fiat sales outlets and 70 for Jeep. Giving an overview of what lies ahead Kate Saxton said that this year will be a busy one for FCA with the arrival of more new models. The sporting Abarth brand will continue to grow with the arrival of their version of the Fiat 124 Spider in 170bhp form. Deliveries of the 140bhp Fiat Spider two seater sports cars will continue to grow. The Fiat 124 Spider and Mazda MX5 on which it is based are both built by Mazda in Japan with the Spider using Fiat’s own 1.4-litte engine, gearbox, and distinctive exterior body panels. She said that Fiat is now receiving deliveries of their Fullback 2.4-litre Double Cab pick-ups which will be sold both through Fiat passenger car dealerships and their LCV dealers as the vehicle competes for sales in both the lifestyle and commercial market sectors. The Fullback is more or less identical to the best selling Mitsubishi L200 Double Cab models as they are currently built on the same Mitsubishi Motors production lines in Thailand. She added the new Fiat Tipo B-sector five door hatchbacks and Station wagon estates, the Alfa Romeo Giulietta five door C-sector hatchbacks will be joined by the long awaited Alfa Giulia D-sector sports saloon and the Stelvio – Alfa’s first ever SUV. The Jeep range will be boosted with the arrival of the new C-sector Compass SUV range towards the end of this year. The Fiat 500L is due for a mid-life facelift as is the 500X SUV but on that subject she said despite rumours of an Abarth 500X variant nothing is official but it makes sense. The new Fiat 124 Spider range is currently available with four derivatives – Classica at £19,545, Lusso at £22,295, Lusso Plus at £23,295 and Anniversary also at £23,295. Only the equipment specification of these two door, two seater compact soft-tops differ as they are powered by Fiat’s 1.4-litre MultiAir turbocharged 140hp petrol engine with a six-speed manual gearbox. A sportier 1.4-litre 170hp Abarth version is just arriving priced at £29,429. All versions are built in Japan alongside the Mazda MX5 on which it is based and Abarth add their final touches after production of the core vehicle arriving from Japan. Mazda provides the platform and inner panels, Fiat for their and Abarth versions provides the engine, transmission, suspension and outer panels plus some interior trim and equipment. I had a very brief drive of the Fiat 124 Lusso Plus variant which proved to be nippy, fun to drive and well priced but slightly more expensive than the MX5 which has a 1.5-litre 131hp petrol engine. The 124 Spider has a top speed of 134mph with zero to 62mph taking 7.5-seconds. The official Combined Cycle fuel economy is 44.1mpg and on our test drive around some busy roads in the Cardiff area the real-life figure was 40.8mpg. With CO2 emissions of 148g/km VED road tax is £145 a year. On the very wet roads the Spider felt well balanced in the handling department and in most other ways there is little to choose between it and the Mazda MX5 Convertible. Interior space for both of them is not good for six-footers. It is difficult to get in and out of the car, there was not enough legroom in the driver’s position and there was not very must storage space for even small items. The ride is firm and the rear visibility limited with the hood up. There is a small 149-litre boot at the rear. It doesn’t sound too good does it but the 124 Spider is an open top small sports car so you cannot expect much else. For soft-top motoring fans on the right day with good weather it would be fun car to own, neat, nimble and good looking. Apart from a small amount of different badging, front grille and interior trim styling changes the Fiat Fullback 2.4 Double Cab range is a mirror image of the best selling Mitsubishi L200 Double Cab range. The Fiat versions are built alongside the L200s in Thailand. Like the L200 the Fullback is available with a 2.4-litre, four-cylinder turbodiesel engine and available in two power output forms, 150 and 180hp with an automatic gearbox option on the higher output engine. All versions for both brands have selectable dual ratio 2WD/4WD traction. All have a payload of 1,045kg and all have a 3,100kg braked towing weight. Prices are not dissimilar either with the Fullback retail prices ranging from £26,373 to £30,633 whilst the Mitsubishi L200 prices are £24,583 to £30,223. With its four door Double Cab body there is seating for five passengers and the Fullback LX mid range spec LX version I briefly tested the equipment level was comprehensive with electric windows, air con, lane departure warning, cruise control, rear view camera, 6.1-inch touchscreen with sat-nav, Bluetooth and DAB radio. The difference between the Fiat versions and the Mitsubishi Double Cabs is too close to call. The Fullback is available both through Fiat’s passenger car dealerships and their Fiat Professional commercial vehicle outlets. They both drive identically with a good 430Nm of torque from 2,500rpm giving a gutsy performance. Top speed is 111mph and the Combined Cycle fuel consumption is officially 40.9mpg and we recorded 37.7mpg on a short test drive using roads around the South Wales area. The VED road tax is £230 a year, the commercial vehicle rate for such vehicles. The ride can be on the firm side if the vehicle is unladen but the durability, strength and versatility of the L200 is legendary so you would have to expect the Fiat Fullback to be the same. They both will appeal to retail customers who like the lifestyle usage as well as the commercial vehicle operators. The UK’s Double Cab market with the L200, Ford Range, Nissan Navara and others continues to grow and the new Fiat Fullback will be a valuable addition to that market sector as well as being a valuable boost for the Fiat brand. The Giulietta five door hatchback is one of the mainstays of the Alfa range with its C-segment size competing against the likes of the Ford Focus, Vauxhall Astra and VW Golf. Its iconic brand name suggests it is a niche choice rather than volume selling competitor. Last year it achieved around 2,500 UK sales, just over half of the brand’s total registrations. The 17 variant range includes 1.4 and 1.75-litre petrol and 1.6 and 2.0-litre turbodiesel engines with a wide choice of spec levels. Prices start from £18,450 and go up to £28,330. But the mainstay of the models is the 1.6-litre 120hp turbodiesels with prices starting from £19,500. My test version with that 1.6-litre unit and Super spec costs £22,110. This model gives significant sales potential for company car users. With CO2 emissions of only 99g/m, Benefit-in-Kind tax is 19% but all buyers will enjoy, for now, the zero costs VED road tax however that goes up from 1 April in the latest VED price structure to £120 for the First Year rate and £140 each year after that. Insurance is Group 16. Performance is lively from the 120hp, 320Nm JTDm turbodiesel unit with a top speed of 121mph and zero to 62mph takes 10-seconds. More importantly the Combined Cycle fuel consumption figure is an impressive 74.3mpg but our brief test drive in the busy Cardiff area traffic returned a real-life figure of 47.8mpg. The hatchback enjoys sports styling with its coupe side profile and that all important iconic Alfa Romeo badging. Inside it is less impressive with too much hard plastic trim but in fairness it is has a nice combination of textured finishes. The specification is high and includes Alfa’s D.N.A driving mode selector which adjusts the front wheel drive traction and power delivery through All Weather, Natural and Dynamic modes. I found the driving pedals too far offset to the left for my long legs and the ride was firm. It offers a different and niche choice in its high volume sales sector. Last year was the 75th anniversary of the all-American Jeep Brand although it is under the Fiat Chrysler Automobiles group of companies. With a record 14,090 UK sales last year it achieved the fourth fastest growing brand status in the UK market, impressive for a range of SUVs. 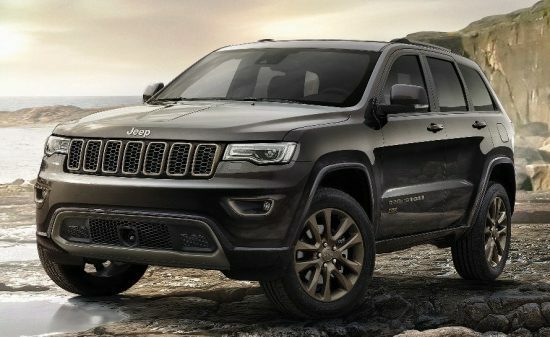 The range currently includes the Renegade compact SUV which sold around 11,000 units with the rest of the sales total achieved by the mid-sized Cherokee, the flagship Grand Cherokee and the hard-core Wrangler which harks back to the original Jeeps with its rugged go anywhere abilities. The arrival of yet another 4×4 in the form of the Jeep Compass should continue to cover all demands for unmistakable iconic American styled SUVs. To reacquaint myself with Jeep I had a short driving spell in the Grand Cherokee 3.0 CRD V6 75th Anniversary model costing £52,635. Range prices go from £45,050 to £69,865. The mainstay of the range are 3.0-litre, V6 CRD turbodiesel powered 247hp models. For those customers that want the ultimate all-American experience there is the option of a 6.4-litre, V8, HEMI 461hp petrol engine. All are 4WD versions and all have eight-speed automatic gearboxes. The Grand Cherokee models are big and imposing whatever the choice of engine. At 4,828mm in length there is seating for five passengers in comfort and still a boot space of 782-litres. This grows to 1,554-litres with the plush rear seats folded down. If you want to tow then the braked weight is 3,500kg. The latest Grand Cherokees remain big, tall and upright large 4x4s but it is clear to see that they are now more European with their interior design and in particular with the quality of fit and finish. The specification for the test version as you would expect being an Anniversary model is high. There is a new unique grille design and front interior fascia panel. Inside there is leather upholstery, electrically adjustable front seats, Uconnect 8.4-inch touchscreen which includes voice command with access to the DAB radio and sat-nav system. Both the front and rear rows of seats are heated with all the usual features of electric windows, electric door mirrors, air-con, adaptive cruise control, forward collision alerts, blind spot monitoring, rear view camera, powered tailgate, keyless entry and a push button start but that is hidden behind the steering wheel so not such a good design, and auto lights and wipers. Technically this version has Quadra-Lift air suspension which gives a compliant, even luxurious ride without harming the road holding too much. It of course also has Quadra-Drive 4WD system plus a smooth eight-speed automatic gear. The 3.0-litre, V6, CRD turbodiesel engine pushes out 247bhp but a mighty 570Nm of torque from just 1,800rpm so the engine is immediately responsive at low speeds right through the mid range for brisk acceleration when needed. The top speed is a modest 126mph and the zero to 62mph acceleration time is 8.2-seconds. Officially this model will return 40.4mpg in the Combined Cycle and on our short test drive around the more scenic costal roads of South Wales a real-life figure of 32.8mpg was recorded. The CO2 emissions are officially given as 184g/km so VED First Year road tax costs £355 before reducing to £230 for Year Two onwards. But from 1 April this year these tax rates change and VED First Year tax will cost £800, and breaking the new £40k on-the-road costs the price after the initial First Year rate is £140 plus the cap rate of £310 making it £450 a year for the next five years. If you want one buy it before the end of March 2017. Company car drivers will currently pay 36% Benefit-in-Kind tax and that goes up to a maximum 37% again from 1 April whether you buy it now or then. Insurance is costly as well with a Group 41E rating. Although running costs are high the Grand Cherokee is a lot of big SUV for the money. It might not be as agile to drive as say the German brand largest SUVs which are more geared-up for road use but next to the Range Rover its off road capabilities, as you would expect from a Jeep, are impressive. It will remain a niche large 4×4 on our UK roads with annual sales normally around the 1,500 units figure.